I rediscovered a Martha Stewart Christmas Cookie magazine in my recipe book cupboard on the weekend. I flipped through the pages undecided about what to make…and yet unable to make anything. Most of the recipes contained various nut manifestations which I don’t keep in the cupboard. So on my weekend shop I bought ground almonds, walnuts and pecans. Yesterday afternoon I made the first recipe in the magazine that took my fancy, Mexican Wedding Cakes. It was one of those days where I couldn’t seem to stop eating. You know those days? The name is curious. Apparently the recipe originates from the middle ages and was popular in England (and probably Europe). They were known as a Russian Tea cakes, the Americans liked to call them butterballs. Generally it was considered a kind of motley pastry made of nuts, flour and butter. 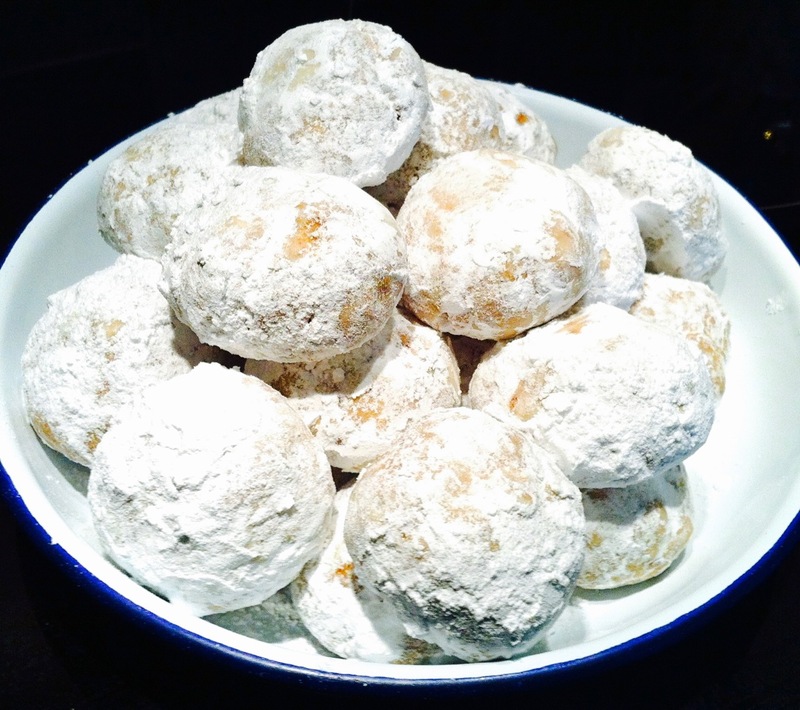 They were covered in icing sugar while hot, and then again after they cool. Eaten during celebrations they were and I guess these ones are Mexican because they contain cinnamon. The recipe is too easy. No mixer required, but you do have to whip out the food processor, but that’s all . You literally tip all the ingredients in and wiz it up. I had a roast chicken in the oven so I couldn’t bake them till after dinner, plus the dough had to cool in the fridge. The sweet coating of icing sugar gives way to a heavy crunch and then the flavours burst through. Often I don’t care much for cookies…but these, along with a select few others (like melting moments and lemon meltaways for example, oh and burnt butter cookies) are worth every calorie. In a food processor, blitz all the dry ingredients until it resembles a course meal. Add butter and blitz till a dough forms. Wrap and refrigerate for an hour. Roll into balls and bake on lined trays, rotating if needed.